Global warming has resulted in a subtle increase to ocean temperatures, which in turn has resulted in a measurable increase in jellyfish populations. 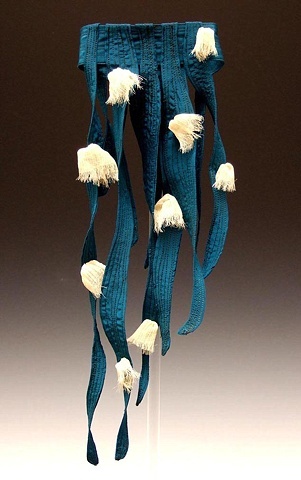 Jellyfish made out of recycled old clothes are visual reminders of the need to reduce consumer waste. To make your own Jellyfish Pendant, look for my Jellyfish Pendant How To Project available in Stitched Jewels: Jewelry That's Sewn, Stuffed, Gathered, & Frayed by Lark Books, 2009.